Reversible phosphorylation leads to the transmission of cellular signals through a complex and intertwined system of pathways. 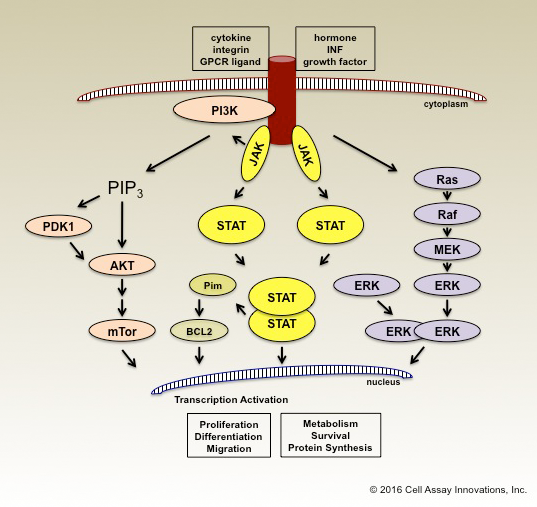 At CAI, we are introducing ClariPATHWAY™ assays to assess inhibitor activity against specific cell pathways in the context of endogenous protein expression. IC50 and potency information obtained from these cell-based assays is valuable for determining mechanism of action, activity, selectivity, and the potential for off-target effects against the given signal transduction pathways. © 2016 Cell Assay Innovations, Inc.